The English doctoral program at the Graduate Center of the City University of New York hosts an annual interdisciplinary graduate student conference that invites scholars from within and outside of CUNY to share their work. 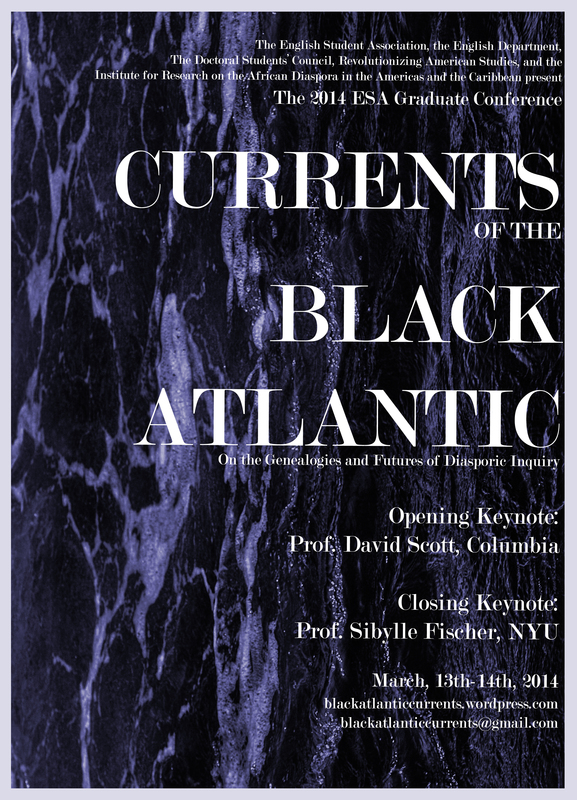 I was a co-organizer for the 2014 “Currents of the Black Atlantic” conference. It was inspired by the twentieth anniversary of Paul Gilroy’s seminal text and a number of events and courses organized around The Black Atlantic occurring in the Graduate Center and the surrounding New York-metropolitan area, including The Black Atlantic @ Twenty (BA@20) initiative sponsored by Revolutionizing American Studies. The BA@20 arranged a number of public lectures that brought together scholar-activists, including Paul Gilroy himself, to the Graduate Center to explore the legacies of The Black Atlantic and its impact on fields ranging from transatlantic and Black studies to visual culture, musicology and diaspora studies. This conference was imagined as an opportunity for students to present their research thinking with, through, alongside, and beyond the parameters of Gilroy’s Black Atlantic paradigm. We received a number of exciting paper proposals that explored topics from black Atlantic temporalities and early modern poetics to alternative diasporas and musical countercultures. Visit the live conference website here! To kick off the conference, we also organized a roundtable discussion, “Preludes: on the Politics and Poetics of Black Atlantic Pedagogy,” which brought together student perspectives on engaging with Gilroy’s text alongside those of faculty members at the Graduate Center who have taught courses on and around The Black Atlantic. It was a rich conversation about the pedagogical strategies, challenges, and ongoing investments in studying and thinking through the insights Gilroy’s work has offered into topics as far ranging as modernity, diaspora, education, critical practice, and music. As one of the discussants for this round table conversation, I had the opportunity to share my reflections on the impact that Gilroy’s The Black Atlantic has had on my research and intellectual development. Since they are too many and varied to list here, I will instead share some of the questions I posed that night: What are the implications of teaching Gilroy’s work today in the space of the classroom, the academy, the United States, and our globalized world? What work does the concept of the Black Atlantic “do” in these different spaces and how might we contemplate the history of the middle passage in relation to the expansion of global capitalism and the development of new communications technologies? Finally, if the slave ship was the image-concept of modernity that Gilroy proposes in The Black Atlantic, what image-concepts possess the potential for mobilizing new critical practices and pedagogies in the present? Credits to Timothy Griffiths for the conference flyer designs.